BEIJING (Reuters) - China on Tuesday condemned measures targeting it in a new U.S. defense act, saying it exaggerated antagonism and that Beijing would take a close look at aspects that beef up the role of a U.S. panel that reviews foreign investment proposals. China's complaints about the act come as the world's two biggest economies engage in an increasingly bitter fight over trade, levying tariffs on each others' products. 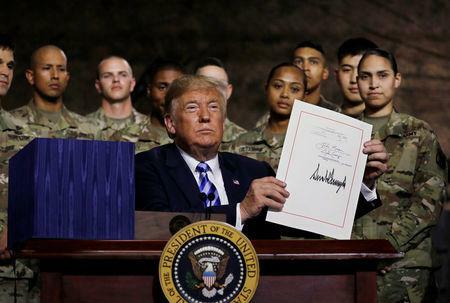 U.S. President Donald Trump signed a $716-billion defense policy act on Monday that authorizes military spending and waters down controls on U.S. government contracts with China's ZTE Corp <000063.SZ> and Huawei Technologies Co Ltd .
China's Commerce Ministry said it had noted the inclusion of CFIUS in the act and would "comprehensively assess the contents", paying close attention to the impact on Chinese firms. "The U.S. side should objectively and fairly treat Chinese investors, and avoid CFIUS becoming an obstacle to investment cooperation between Chinese and U.S. firms," the ministry said in a statement. Chinese and U.S. companies seek greater cooperation on investment, it added, urging the two countries' governments to heed the voices of their companies, and provide a good environment and stable expectations. Monday's legislation also calls "long-term strategic competition with China" a top priority for the United States, which should improve the defense capabilities of self-ruled Taiwan, claimed by China as a wayward province. In a separate statement, China's foreign ministry said the United States passed the act despite China's strong objections and it was dissatisfied with the "negative content related to China". China's Defense Ministry also weighed in, saying the act "exaggerated Sino-U.S. antagonism", damaged trust between the two militaries and involved the most important and sensitive issue in bilateral ties, namely Taiwan. "We will never let any person, at any time or in any form split Taiwan off from China," it added. In Taipei, Taiwan's Foreign Ministry thanked the United States for its consistent support. Taiwan would "continue to actively coordinate with the U.S. government to stably deepen the security partnership between Taiwan and the United States on a mutually beneficial basis", Taiwan's foreign ministry said. The United States has no formal ties with Taiwan but is the island's strongest ally and sole foreign arms supplier. What Does China Maple Leaf Educational Systems Limited's (HKG:1317) P/E Ratio Tell You?